On Monday morning, I opined that the so-called "tariff tantrum" (I.E. last week's 3.5-day, 5% decline in response to the threat of tariffs on steel and aluminum) had ushered in the third chapter in the "crash playbook" - aka the "retest phase." Unlike the first two phases - the "emotional decline" and the "dead cat bounce" - the "retest" doesn't always play out the same way. 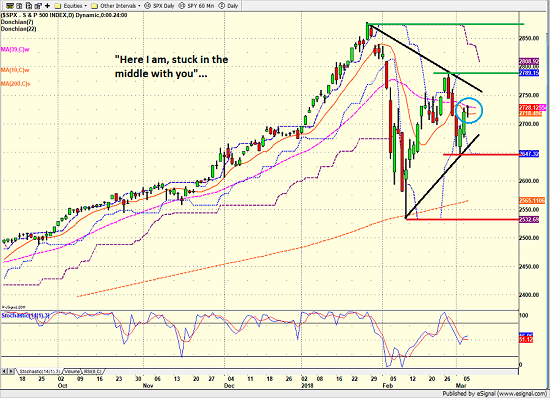 Sometimes the retest is short and shallow. Other times it is deeper and more meaningful. And then there are even times when the indices "take out" the old lows, scaring the bajeebers out of everyone involved in the process. However, the concept of the move is usually the same. After a spirited dive and some sort of "sigh of relief" rebound, something usually comes to the surface to remind traders of why the decline started in the first place. In this case, Chairman Powell's testimony on Capitol Hill triggered fears of a fourth rate hike this year and got traders leaning on the sell button again. And then it was the President's almost off-the-cuff announcement of tariffs that really got the ball rolling for our furry friends in the bear camp. Just like that, the warm and fuzzy feeling that had accompanied the 7.7% rebound from the February 8 low was gone and worries about the outlook for rates and the economy took center stage. Bam, the S&P gave up 5%. But after three straight red closes and another impressive Friday reversal, some are arguing that the "retest" is now over. I see their point here. Stocks reached extreme oversold levels during the dive and sentiment readings reversed hard. In addition, there were some positive technical divergences during the Feb 9 washout and reversal. And now that the S&P has retraced half of the "retest" decline, those favoring the bull camp can certainly argue that a check mark can be made on the "retest." But, I decided a long time ago to not make "bets" on whether a bottom "should" be in or not. No, I find it much safer to simply let Ms. Market tell me when the corrective phase has ended. And this is where a little chart analysis/voodoo comes in. The chart below is one of the most interesting I've seen in a very long time. And I think the action in the coming days will act as an "announcement" regarding what will come next. First, note the downtrend and uptrend lines drawn in black from the recent highs and lows. In technical terms, this is called a "wedge." And since the S&P currently resides in the center of the wedge, my technician friends tell me that the line the indices break first will determine the direction of the next trend. However, one thing I've learned about technical analysis in the high-speed trading era is that nothing is simple anymore and trendlines breaking aren't the neat and tidy signals they once were. So, I've drawn in a few more lines here. While a trendline break in either direction would definitely be worth noting, I'll argue that the near-term support and resistance would actually carry more weight. Thus, a break above the green line at 2789 would likely trigger a test of the top green line (the old high) and a break below the first red line at 2645(ish) would create a move toward the next red line (the old low). Rarely do we see such a wonderfully symmetrical set up. And with the market sitting almost exactly in the center of the entire formation, I have to believe that a break of either team's line in the sand is going to be very important. Just when I thought "normal" market forces (and yes, I use that term tongue in cheek) would produce a technical outcome on the charts, the news of Gary Cohn's resignation hits the wires. Traders are voting with their feet and the algos are running wild once again as the thinking is that Cohn's resignation lends credence to the idea that the tariffs may actually be put into effect. As such, it looks like the "C" leg of the retest phase (where leg "A" is down, leg "b" is up, and leg "c" is down) is about to begin. So stay tuned and be sure to watch those lines in the sand.